Lögberg was an Icelandic newspaper published in Winnipeg, Manitoba from January 1888 to July 1959. 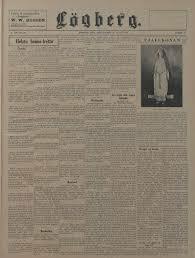 It was a weekly newspaper in Icelandic and English languages. The title of this newspaper refers to the location of Icelandic 'Althing', the world's oldest parliament. Lögberg was started by S. Jonasson as a liberal lutheran newspaper to oppose Heimskringla. It was published bi-weekly from 1892 to 1895. Lögberg merged with Heimskringla to form Lögberg-Heimskringla in 1959. The English content varied according to issues. Log̈berg Print. & Publ. Co.